The SeeGull® CW Transmitter supports the design, verification, and optimization of in-building networks. Complex propogation environments with multiple technologies and bands create challenges for in-building deployments. The SeeGull CW Transmitter mimics these complex environments, so that coverage and interference problems can be solved before deployment. The SeeGull CW Transmitter emits up to four simultaneous continuous wave signals with a frequency range of 400 MHz to 2.7 GHz. 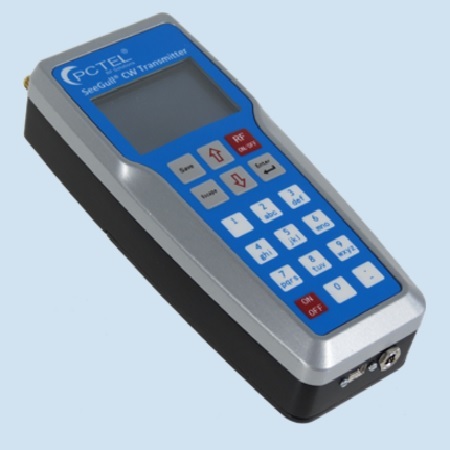 This replicates a wide range of live network environments for RF propagation testing. Data can be collected through a PCTEL scanning receiver and processed using SeeHawk® Touch, SeeHawk® Collect, or third-party tools. The results can be used to validate or modify a design with optimal antenna locations and coverage capability for each segment of an in-building cellular network.